very cute earrings but very cheap metal, they hurt my ears. These earrings are great to perk up an outfit during the workday or to make an evening outfit more special. 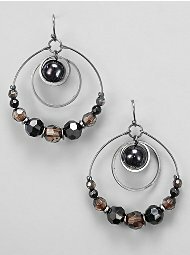 All of NY &Co's earrings are extremely affordable and I often walk out with 3 or 4 pairs each time I shop!